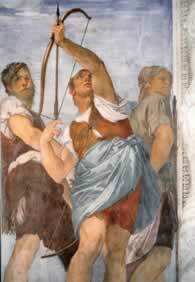 This tour concentrates on the two princes of Venetian color: Paolo Veronese and Giambattista Tiepolo. Veronese was a painter of extraordinary qualities with a ravishingly decorative talent, fond of striking illusionism, shimmering colors and curious perspectives. He spent many years decorating the church of San Sebastiano, such a comprehensive monument to Veronese, where he left the most well preserved fresco cycle in Venice, creating a thematically unified interior that blurs the bounds of art and reality. The artist is buried in the church. Not far from San Sebastiano we find the Scuola dei Carmini, a handsome 17thC building built by the baroque architect Longhena as the seat of an ancient lay-confraternity. 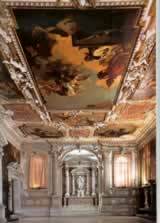 The interior was decorated by Giambattista Tiepolo, the painter who can be considered the crowning glory and the leading artist in 18thC Venice. We will admire his incredible group of ceiling paintings with an oustanding airy vision of the Mother of Mercy, shimmering in silken drapery. The price includes: the service of a certified tour guide.